I love having guests over, and I especially like to cook for them. Just recently a friend from college stopped by my place – or rather, my friend, family member, shopping partner, fellow ‘cakemonster’, wedding parties date, my shoulder to cry on … He means a lot to me, so it’s very important to me for him to be full and happy :) So I cooked him something nice. (And he brought me beautiful sunflowers so he certainly deserved a good chow). The outside temperature reached 36 ° C that day, so I was sure I wanted something light. D. doesn’t eat gluten, so I had to narrow my choices a bit, but we have a very similar taste in food and I quickly found a solution. This dish was inspired by a post that I found on the blog Just good food – although I wouldn’t even look at the recipe, I just followed my intuition. 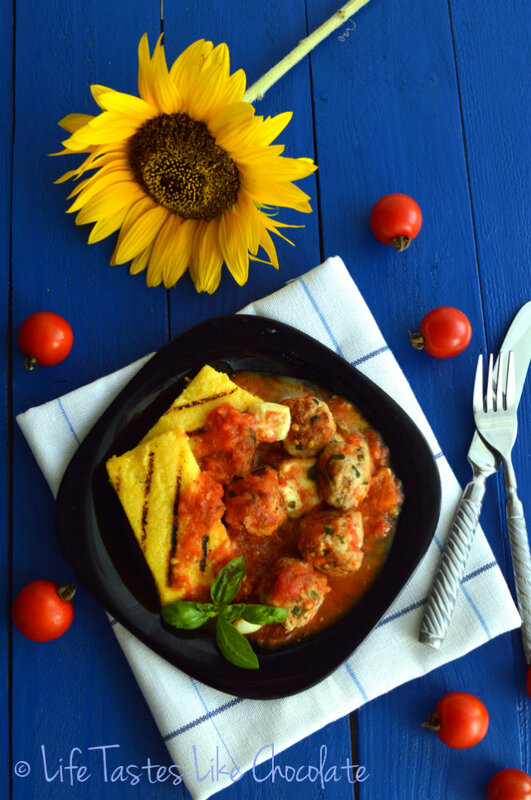 This tomato sauce (homemade, from tomatos from my mom’s garden) I often make with pasta because it is very quick and easy, and now I just popped meatballs in and served it with polenta. The combination is great – you get a very tasty lunch that you’ll want to lick of the plate (at least we did). Serve with a green salad or fresh cucumbers. In less than two hours you'll get the best summer luch! Cook according to instructions on the bag (the ratio of water and polenta is 3:1), then pour it in the oil-coated mold and smooth out the surface. Cool to room temperature and place for two hours in the refrigerator. After two hours, cut it into pieces as desired, and coat each piece with a little olive oil. Bake on a hot grill pan for about 3 minutes on each side, until the occurrence of 'grill-lines'. Clean the stems of tomatoes, cut a cross on the bottom and blanch for 1 minute in boiling water. Peel the skin and cut the tomatoes into small cubes. Place the ground turkey in a bowl, mix with finely chopped onion, two cloves of finely chopped garlic, chives or parsley and season with salt and pepper. Make balls the size of walnuts and place them on a plate. Let the meat rest for 20 minutes. Then fry them on all sides on two tablespoons of olive oil, about 5-7 minutes. When they're crispy on all sides, remove them to a plate. Add another tablespoon of olive oil to the same pan and then fry three cloves of garlic cut into slices. Being careful not to burn the garlic, add the tomatoes and simmer for 5 minutes. Then add salt, pepper and oregano (dried or fresh). Return the meat and cook it all together for 10-15 minutes, until the tomatoes get completely soft. Finally, add the basil and diced mozzarella. 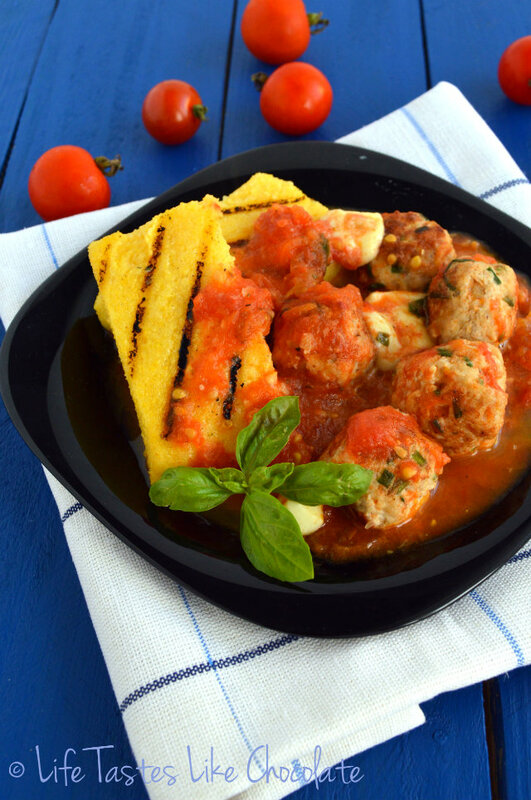 Serve the polenta and meatballs in sauce while still hot, with a green salad. Bon appetit! Please click on the thumbnails for more photos..